Stormwater used to be viewed as a liability – it was shuttled into storm drains as fast as possible to prevent flooding – and then dumped into the ocean, rivers or streams. But increasingly, stormwater is now being viewed as an asset – a way to help augment water supplies and adapt to a changing climate. A new report on stormwater capture issued by the Pacific Institute – the Oakland, California-based water think tank – looks at regulatory and funding challenges as well as creative solutions and collaborations. “While obstacles, such as lack of guidance on health and safety guidelines and inadequate funding remain, work at the state-level has supported a more holistic and integrated approach to stormwater management,” the report found. Morgan Shimabuku, a research associate at the Pacific Institute and coauthor of the report, spoke with Water Deeply about municipal stormwater leaders, overcoming barriers and how better use of stormwater can increase climate change resilience. Water Deeply: Why have views about the potential of stormwater changed? Morgan Shimabuku: What’s changed in a lot of ways are our needs as a society. We have more people, a greater demand on water resources and so we are looking more closely at the different options that are out there for new water supplies. And in addition, this isn’t something we talk about in the report, but you could definitely point to better technology for treating water. Water Deeply: What are some of the ways that people are now looking at using stormwater? Shimabuku: One is to recharge groundwater and recharge aquifers that are used for drinking water and/or agricultural water. So, in Fresno, for example, the flood district there has designed a neighborhood-scale stormwater capture system where in 1-2 mile areas there will be drainage basins that capture stormwater. And that is routed to a place where that can recharge the aquifer. And in Fresno, the aquifer is used for drinking water and for agriculture. So that’s one way. In Santa Monica, they set a goal to supply all of their water locally by the year 2022. They have designed a lot of stormwater capture systems that capture and treat that water on site and use it close by for irrigation or toilet flushing or things like that. Water Deeply: What are the barriers to scaling this up and having stormwater be a bigger part of the water supply picture? Shimabuku: Some of the main barriers that communities face across the state have to do with local policies, rules and regulations or with finding the funding to implement different projects. For policies, it can be something simple. 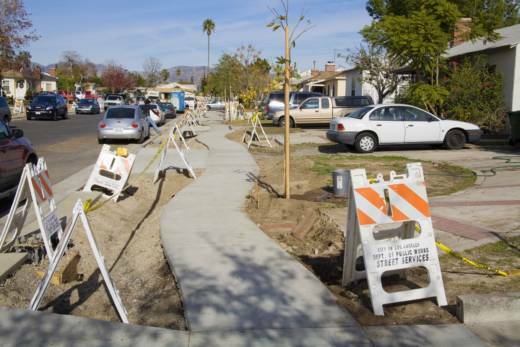 If a community has a groundwater aquifer they’d like to recharge but in their municipal code there are rules against constructing streets and parking lots that allow for routing that water into natural areas rather than into the sewer, then that can prevent localized recharge. So, in Gonzales, California, they were able to update their municipal city code to state that they could make curbs have reduced height. So that around a parking lot, for example, where there are a bunch of curbs, the water flowing off the parking lot could run into the vegetated areas that were surrounding the parking lot rather than a storm drain. For funding, a lot of places that are looking at stormwater for a water supply may not have the funds to invest in designing a capture system that is able to provide enough water supply to make it worth it. So what we’ve seen is a lot of collaboration across different agencies that can bring in new funding partners. Another good example of that is in San Mateo County they have a City/County Association of Governments of San Mateo County, which is responsible for a host of different local programs related to transportation and pollution. Because they are responsible for both those areas, they came up with this neat way to fund stormwater green infrastructure devices, which are nature-based engineering solutions that often can capture and allow stormwater to go into the groundwater. They were able to fund these things through an annual vehicle registration fee because that also could apply to their traffic responsibility. Water Deeply: What else is needed at the state level to help scale this? Shimabuku: In California there has been a pretty good push in the policy arena to support stormwater capture for water supply and ensure that local communities that are pursuing that path, that they are supported by state-level policy. A lot of the more recent funding is through Proposition 1 from 2014 or through Proposition 84 from 2006. Those both had stormwater-specific grant funds that discussed the multiple benefits of capturing stormwater – reducing pollution, reducing potential flooding impacts and water supply. But we also saw that the state could really help local communities in their effort to capture stormwater by offering more guidelines or model ordinances on things like health and safety codes for stormwater reuse. As with Gonzales, we could use more model ordinances that help communities update their municipal codes that allow them to better capture stormwater. We also think that the state needs to reduce funding barriers and find more funding for stormwater capture specifically because it is such a great local option. I think we also need more research to better quantify the monetary benefits of all the different aspects of stormwater capture including flooding, water quality and water supply. Water Deeply: What about the water rights aspect if you’re capturing water that would otherwise be flowing downstream to someone else? Shimabuku: It’s not as much of an issue if you’re a community right on the ocean, because there aren’t downstream users that are being impacted. However, for those communities that are not right on the ocean, there are processes that they will likely need to go through to be permitted to capture that stormwater. Water Deeply: How does stormwater fit into the larger picture of climate resilience? Shimabuku: Stormwater is an abundant supply in California and it should be captured, treated and used. And by using it, communities can address the three issues of pollution, flooding and water supply, if not other issues. One of the other great opportunities with stormwater capture is that it really hopes to address what climate scientists are predicting for the future, and possibly our current climate is showing us here in California, and that is periods of high rainfall events and then longer periods of drought. By capturing stormwater we can both help to reduce flooding impacts of heavy rainfall periods as well as improve local water supplies. It really is a great solution for a community to become more resilient to climate change.